The Venezia area is quiet during the daytime, coming alive in the evenings when the many bars and restaurants open for business. 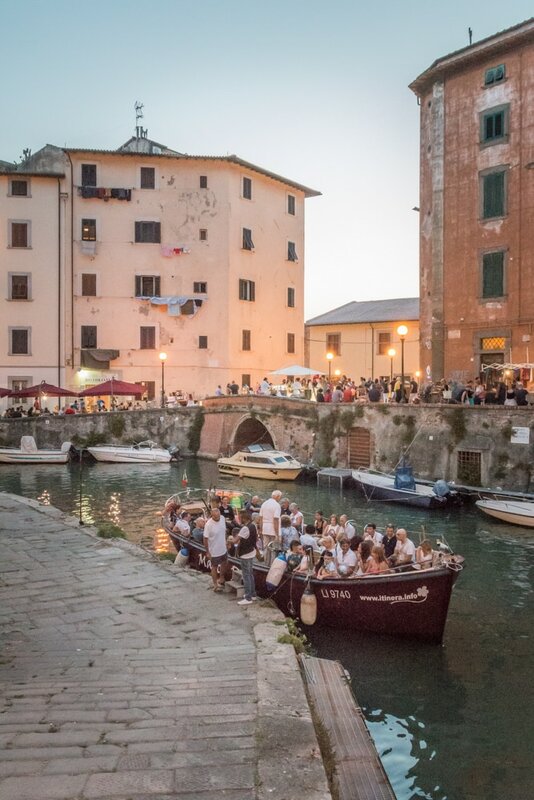 Livorno’s Venezia district is also the stage for the important annual Effetto Venezia festival that begins at the end of July. View from Piazza dei Domenicani to the Fortezza Nuova Via Borra then opens up into the bright Piazza dei Domenicani with views to the left along the canal and right towards the 17th-century Fortezza Nuova ('new fortress'). 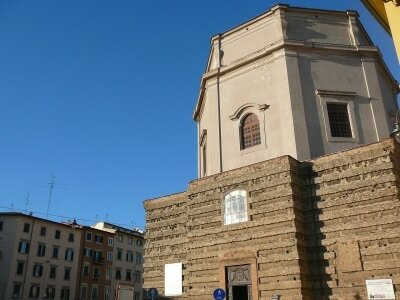 Dominating Piazza dei Domenicani is the recently restored octagonal Church of Santa Caterina dating from 1720, one of Livorno's most beautiful churches and certainly worth a visit. Inside the church there is a large altar piece portraying the Incoronation of The Church of Santa Caterina, home to an altar piece by Giorgio Vasari the Virgin by Giorgio Vasari now restored. There is also a lovely wooden crib by Cesare Tarrini in the chapel dedicated to the Madonna del Rosario. Behind the church lies the former convent and later prison in which Sandro Pertini (later President of Italy) and Ilio Barontini were imprisoned during the Fascist period for their partisan activity. Over the bridge you come to a series of historic buildings which belonged to the foreign merchant families who settled in Livorno following Ferdinando I dei Medici’s Leggi Livornine which encouraged foreign trade in the city. The street has a stern appearance and there isn't much sunlight, but look out for Palazzo Huigens, a typical example of Livornese Baroque where many important princes and kings stayed including the Grand Duke of Tuscany Cosimo III and the King of Denmark Frederick IV, and the Palazzo delle Colonne (‘palace of columns’ after the two columns standing on either side of the main entrance and taking up most of the pavement) which once housed the state archives. It was designed by Giovan Battista Foggini. Its marble facade distinguishes it from all the other buildings in the street. Starting from the square in front of the Town Hall (Comune) where the cruise ship shuttle buses drop off and where the local Tourist information office is, head down Via del Porticciolo, the narrow road that leads between the Chamber of Commerce building (Palazzo della Dogana) and the new town hall and then take the second turning on the right. 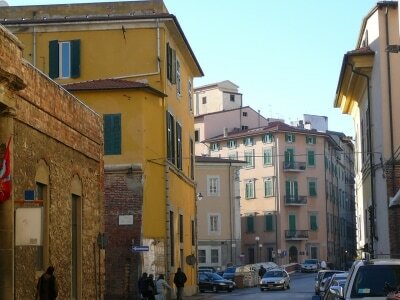 This is Via Borra, the historic residential area of the important merchant families that lived and traded in Livorno in the 17th and 18th centuries. The Venezia district was built in the 17th century by the Medici dukes to meet the needs of the foreign merchants in the city. It provided warehouses along the canals which were easily reached from the port and also directly accessible from the noble residences on street level above. Alternatively you could take a shorter route, along the near-side of the Fortezza Nuova and then back towards the town hall, or you could walk down the side of Santa Caterina and explore the Venezia district further. How long will it take? A gentle stroll down Via Borra and then right round the canal to Piazza della Repubblica will probably take about an hour, including a quick look inside the Church of Santa Caterina, and depending of course on how fast you walk. You might choose to stay in the area for refreshments, or a meal. The short cut will take half an hour off the walking time. Where to have coffee: Happy Day, Letredi. Back at the town hall try Caffetteria Minerva. The Ponte Di Marmo with its marble parapetsAt the beginning of Via Borra you cross a bridge known as the Ponte di Marmo because the bridge’s parapets are made of marble (marmo). 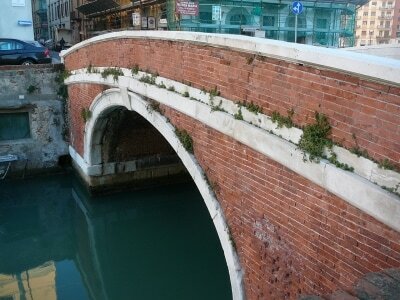 But the most interesting features of the bridge, dating from 1629, are the inscriptions left on the parapets by Livornese boatmen in memory of their loved ones. Continuing past the church The Old San Marco Theatre in the Venezia Quarter, now a nursery school of Santa Caterina, just a short distance along Via San Marco there is an interesting, albeit rather devastated building on the right hand side which used to be a theatre - Teatro San Marco - and was the place where the Italian Communist Party was founded in the 1920s. 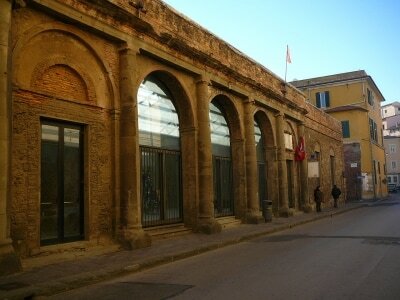 The theatre was inaugurated in 1806 but seriously damaged by an earthquake in 1846 and by the bombs that hit Livorno during the Second World War. It now houses a nursery school. 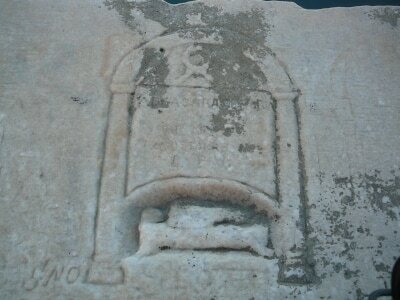 You can walk round the back of the building (take Via dei Floridi and then the Scali del Teatro) for views of the Fortezza Nuova and the Pontino district Historic inscription on the Ponte di Marmo, Venezia district, Livorno of Livorno. Following the canal along Scali del Pontino and Scali delle Cantine will lead you into the huge open space called Piazza della Repubblica from where you can continue along Viale degli Avvalorati to where you began the walk at the town hall.